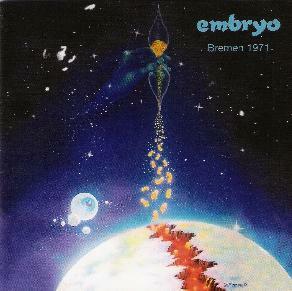 Keep in mind that this is the first Embryo CD I've ever heard. Anything previous of the band I've encountered was a mere single track from the countless various artists discs that are available out and about. 'Bremen 1971' is much better than I had anticipated. For one thing, it's part experimental, part psychedelic rock/jazz. A bit less jazzy than what I expected. But that's a good thing. This four track archive gem was recorded live on September 23, 1971 in Bremen at the Leibnizplatz High School Gymnasium for the Bremen Radio show right after the time their second LP 'Rache' was released. "Try To Be" starts off with some uplifting tribal drum work and some superb flute playing, as "Time - A) You Can't Wait, B) Evans Nuvola" continues the trip, only more uptempo. Maybe it's just the cough syrup talking but I honestly thought that "Tausendfubler" sounded sort of like Hawkwind's 'Hall Of The Mountain Grill' era, vicariously cross-breeding with early '70's Tull. "Spain Yes, Franco Finished" is a 26-minute open jam style-like piece that seems to get better as it progresses. I thought 'Bremen 1971' had plenty of mind expanding drum, sax and flute passages as well as some oddly done vocal chanting to offer it's listeners. Line-up on this disc: Hansi Fischer-flute, Christian Burchard-drums/vocals, Al Jones-guitar, Edgar Hofmann-sax and Ralph Fischer on bass. Burchard is the band's only consistent member, as he's still with the band today. Throughout the Munich ensemble's thirty-plus year career they've apparently toured countries that most bands wouldn't go near, like India, the Middle East, Afghanistan, Africa and Egypt. I would just love to check out their 'Opal', 'Rache' and 'Invisible Documents' CD's sometime. Comes with a keen 28-page booklet that requires some effort to remove and put back without damaging. Might appeal to fans of Morpheus, Eiliff, Brainstorm and mid-'70's Gong.